As the first "M Performance" model to be offered to American buyers - not to be confused with a proper "M" car, mind you - the 2014 BMW M235i has a significant burden to bear. Not only have BMW enthusiasts been demanding a new "affordable" sport coupe from the Bavarians for years, the M235i also has the considerable task of making the case to buyers in the United States that BMW's new mid-range sport level has a reason to exist. Perhaps even more importantly, the M235i also has to assure the faithful that BMW's recent proclivity for placing M badges on vehicles we wouldn't expect to find them on is not a dilution of the brand and its implication. While much of that will ultimately be left to individual perception, we're also happy to report that BMW's decision to give us a chance to flog the M235i around the oval and road course at Las Vegas Speedway was not a regrettable one. BMW's M Performance line is not unlike Audi's S line in that its inherent goal is to strike a balance between sporting capability and everyday driving comfort. Accordingly, the M235i cannot be measured against a car like the BMW 1M, which was essentially a frankenstein'd 135i with an assortment of go-fast bits from the E92 M3 parts bin. At the same time, the M235i is also a much more sport-focused vehicle than a 228i - a good car in its own right, but not cut from the same cloth as this M Performance model. 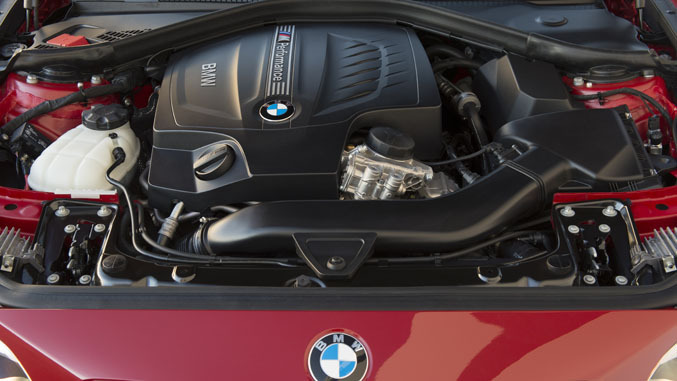 As the "35" would suggest to those familiar with BMW's slightly convoluted naming scheme, the M235i utilizes the twin-scroll turbocharged 3.0-liter inline six-cylinder motor, here making 320 horsepower and 332 lb-ft of torque. With that torque available from between 1,300 and 4,500 rpm and routed through the quick ratios of the 8-speed automatic in our test car, BMW says 60 miles an hour can be had in 4.8 seconds. We have no reason to doubt that claim, as stabs at the throttle from low speeds provided a more than adequate urgency to acceleration, and the M235i's willingness to climb toward its electronically-limited top speed of 155 mph on the oval track at Las Vegas Speedway reassured us that this is a car that likes to move rapidly. Our test of the M235i first took us through the streets of Las Vegas. The relatively sedate nature of our stroll down the strip and surrounding areas gave us a chance to reacquaint ourselves with the driving modes common to most BMWs as of late: Eco, Comfort, Sport and Sport Plus. While common sense might dictate that a vehicle like the M235i should be experienced almost exclusively in Sport and Sport Plus modes at all times, we found the relaxed response and less anxious nature of the gearbox in Comfort mode made the M235i a more enjoyable car when used in cruising situations, as the more aggressive intent of the sport modes legitimately change the car's character enough to make them more appropriate when you actually plan to keep it on boil whenever possible. Going all-in for Sport Plus mode brings a much more sensitive throttle, a transmission more willing to hold gears within their ideal rev range, tightened steering response, and a firmer ride from the active dampers in the Adaptive M Performance suspension package. While the roads of Las Vegas hardly resemble the surface of the moon, there's enough variance in quality of the tarmac to get a good feel for the M235i's behavior on uneven surfaces. BMW has always been a company that's very successful at finding a happy medium between compliance and taut driving dynamics, and the M235i doesn't betray that promise. While composed and comfortable on the street, once we had a chance to get the M235i onto the road course at Las Vegas Speedway, we found the coupe a very competent performer there as well. A bespoke track car it is not, but the M235i is lively and engaging enough to make us long for many more laps around the tight circuit. Our tester was equipped with the standard M Sport braking system, which included a 4-pot caliper setup up front and a 2-pot in the rear. Along with the standard Michelin Pilot Super Sport tires and the M235i's excellent weight balance, the coupe proved a rewarding experience when driven hard, with reasonably communicative steering and fairly neutral cornering habits. However, if we were buying this car with the intent of tracking it on a regular basis, the available M Performance brakes and M Performance suspension are boxes we would be likely to check off on the order form. The standard equipment, while certainly adequate for spirited driving on the street, shows enough signs of compromise to leave us wanting just a little more in a track setting. Larger than the outgoing 135i in nearly every dimension, the 2 series grows by 2.8 inches in length, 1.3 inches in width, and carries a 1.2-inch longer wheelbase. Together, along with front and rear tracks that have been increased by 1.6 inches and 1.7 inches, respectively, the M235i enjoys a significantly more athletic stance than its predecessor. Additionally, the new car comes with a bit more interior and trunk space while managing to maintain a 50:50 weight balance and a curb weight nearly identical to the 1-series of about 3540 pounds, depending on options chosen. Interior materials and construction are exactly what you'd expect from a BMW - high quality, comfortable, and understatedly posh. BMW's iDrive has come a long way from its early days as one of the most vexing vehicle interfaces ever conceived, but the use of an array of buttons and a pivoting, turning, and pressable knob to navigate the menus in an era of nearly obligatory touchscreen capability is beginning to make the entire exercise feel a bit dated. For those accustomed to the iDrive system we doubt there will be many complaints, but that doesn't mean there isn't room for improvement here. 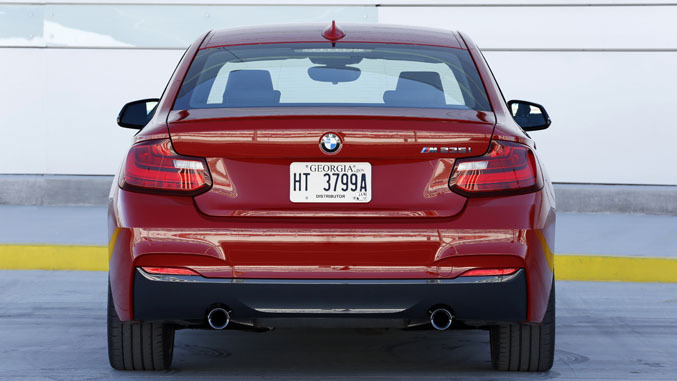 On the whole, the M235i is a welcome addition to the field of rear-drive sport coupes available today. Well balanced in nearly every sense of the term, its concessions to everyday drivability do not work to the detriment of its sporting character. The M235i isn't designed with the express purpose of setting your hair on fire - it's designed to be gazed at from a window and evoke a wide grin, immediately followed by a spontaneous thrashing on your favorite road. To that end, the M235i is a thoroughly successful vehicle.